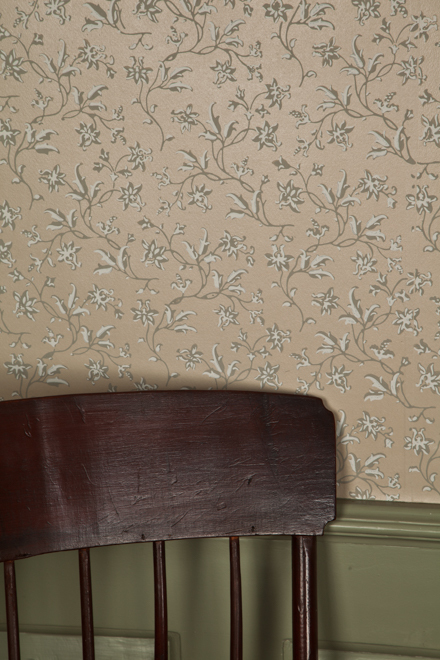 This pattern is licensed to Adelphi Paper Hangings by the Governor Bellingham Cary House Association. Found in the parlor of the 18th century Bellingham-Cary House in Chelsea, Massachusetts, this scrolling vine pattern is an example of an early 19th century roller printed pattern. The relatively small repeat is typical of early mechanized printing, as the technology for producing larger rollers, and therefore larger repeats, had not completely been developed. The coloration of the original document is also indicative of the more muted direction in interior fashions that were to come. Imperial Measurements: Repeat 8 ⅜ inches, width 19 inches, length 11 yards, straight match. Metric Measurements: 21.3 cm, 48.3 cm, 10 m.